Hola amigos aquí el vídeo para conseguir realizar Gran pollo artificiero: oro que nos compensara con una de las nuevas Pet´s de duelo Controlador de minizepelín añadidos en el parche 6.1.2 de la Feria de la Luna Negra espero os sea de ayuda. Para aquellos jugando con el WoW de Latino América, este logro se llama "Gran cohetero: oro". ◾Gran donapoder: oro, for using a Donapoder, rewards Cañón de la Luna Negra. This shoots you out of a cannon and lets you fly for a minute. ◾Gran andariego: oro, for using a Andariego, rewards a Observador de la Luna Negra. This item is quite similar to Ojo de Kilrogg and lets you scout out dangerous areas. ◾Gran pollo artificiero: oro, for using a Pollo artificiero, rewards a Controlador de minizepelín. This teaches the battle pet Minizepelín de carreras. ◾Loco al volante de la carrera del siglo, for using a Zancudo de carreras, rewards a Bandera a cuadros. This increases mount speed by 30% for 10 minutes. ◾ Donapoder: oro, for using a Donapoder, rewards a Mirada de la Luna Negra. This puts a Darkmoon Faire marker over someone's head. ◾Andariego: oro, for using a Andariego, rewards an Señal llamativa. This places down a blinking arrow, similar to the ones used as decorations around the Faire. ◾ Pollo artificiero: oro, for using a Pollo artificiero, rewards an Fuegos artificiales de la Luna Negra eternos. This is a permanent version of Fuegos artificiales de la Luna Negra, a firework with the Faire logo. ◾ Corredor loco al volante de la Luna Negra, for using a Zancudo de carreras, rewards a Vial de tragafuegos. This sets your breath on fire, like many of the Darkmoon Faire NPCs. Either this achievement is bugged, or the lag is insane right now. On this track the Power Ups change between the springs that bounce you forward, the teleporter that shoots you forward and the rocket that shoots you up in the air, they cycle around in the order: Spring -> Teleporter -> Rocket. There are 2 rockets you need to take and wait for them to spawn if you have to. The first rocket you need to take is at 0:16, save the Boosters -Button 1- so you get momentum forward to get on the the ledge, then run up to the highest point and press the Giant Leap -Button 2- to get passed the wall and up to the first banner. The second rocket is at 1:12, wait for it as I did and use the Giant Leap when you're close to the top. When you're in the air towards the finish just press 1 and 2 as they come off cooldown. This one is fairly easy compare to Racing Strider because Rocketeer can climb the cliff using rocket item and jump, therefore save a lot of time. PS: The toy looks very nice! It's a rewarding race! I managed to do it in 19 tolls ^^. Here is a short video guide! Propulsores: Speed boost for 5 seconds. Also makes you leap forward slightly and makes you immune to snare. 10 sec cooldown. Salto gigante: Makes you leap up high into the air, with a parachute. 15 sec cooldown. Tromba de cohetes: Disorients nearby MiniZeps. You will need to pick up a pouch in order to use this. Propulsores and Salto gigante apply a parachute, so you can chain them with the spring to slowfall an impressive distance--for example, on the Real Big Race, from the top of the hill to almost the finish line. Just be careful of low-hanging trees you can parachute into, such as on the last leg of the Real Race. In addition Propulsores makes you immune to snares, so you can run through electrical wires and not get slowed down. Finally succedded with the "climbing strategy" mentioned in some videos on Youtube. - you should land few feet up on the top of the cliff. The Purple Post will be on your left side just a few feet away. I got this achievement first try. A breeze after struggling with the bird. I didn't expect to get the achievement first try, so I only recorded my second. The first attempt was a lot smoother, and I even had a few ticks to spare. In my previous video, you can see that you have to jump up the cliff when using the strider, but with the rocketeer, you can just rocket boost up yourself, and end up at the top much faster than the bird. -Your speed boost and your big rocket boost are up more often than you think, and they can get you really far, really fast. -Use both of your boosts to get up the first cliff. I only used the small boost on the second. -Take the spring when jumping off the high cliff, and then use the big and small boosts. Drop the parachute when you know you'll fall into the post. -As you can see, I had all the time in the world to wait for the rocket at the second cliff jump. -When you get to the path into the Faire, just use your big jump and chute all the way down as far as you can. I got lucky and landed on a rocket powerup and was able to keep flying. I didn't do that the first run, but it was a convenient bit of RNG. -This was an easy win! Lots of room for error. Good luck and have fun, friends! Here is a quick video! I don't know if it's just me but the RNG of the boosts is beyond ridiculous. Almost right on top of it and it changes to something else messing your run. I've done so many runs and it's always one thing or another... can't seem to get this freaking achiev/pet. I have to confess that I tried to solo this heartbreaking race for two days following all possible strategies. I ended up in duo mode. To save your time and health find a companion (for example, via x-cross server search) to stay uptop the cliff by the Purple Post. You just need to grab Regs on your way left and use button 3. It will leap you up straight to the first checkpoint. Cheers! I had 18 tolls score. When you're flying towards the finish line, make sure you don't fly over any of the game areas (for instance, the Turtle Ring Toss arena). The game will detect it, and you'll be slammed back down to the ground and stunned for good measure. Yes, I discovered this the hard way. another helpful hint: any of the non-speed boost power-ups seem to swap every few seconds between each other, so if you see a rocket in a distance, it might be a portal or a spring by the time you reach it. Actually you have plenty of room for mistakes. I managed to get gold even after hitting a wire trap. The trick is to use rockets to jump onto cliffs - you do it twice. And while the buffs keep changing, I simply waited for the appropriate one to appear on the second high jump. I am not sure if this is a glitch or it is intended but I will keep going. Today after infinite tries and endless desperation I found accidentally the very best way to complete each race with 04-05 tolls. Basically you start the race and then enter arena.When the arena is over(or you leave it) you will find yourself mounted up in the middle of the race but without any power-ups or tracks of the run,except for the main objects ( the blue green and red pillars ). At this point you will only need to reach every pillar and instantly enter arena again,the tolls will restart from where u left and pillar by pillar your tolls will only count the time in between you reaching the pillar and entering arena. It's a bit hard to explain but so easy to replicate and it will grant you 100% ez pz achiev + toy. So again: you start the race, enter arena(skirmish or w/e),finish arena, run without pressure to first pillar, tolls will restart counting, in and out arena again, reach other pillar, in and out last pillar and run to the finish line.Basically what entering the arena does is stopping the toll timer until you reach another pillar, so you can easily run through the race without any pressure. English is not my main language,please report any unclear infos and I'll try to clear that out. I'm not sure if phasing in dungeons will work anyway but arenas are by far the easiest. For you guyz that do this and @#$% up a lot like me, and are tired of opening the dang log to abandon the quest, use this. Just make sure its the quest that is highlighted. I like to have a heading going into these things, so here are the waypoints for the posts and finish. Note: I cheated the Finish Line point to the left of the arch a bit so it's less likely to vanish as you start the race! The nerf is in the Toll timing, back when all the videos regarding how easy it is to do came out the "Toll" timing was 10 seconds, now it's 6 Seconds! I tried and tried and even got so frustrated that I tried to race the people who posted the videos, I beat them every time... but my "Toll" count was always way higher. 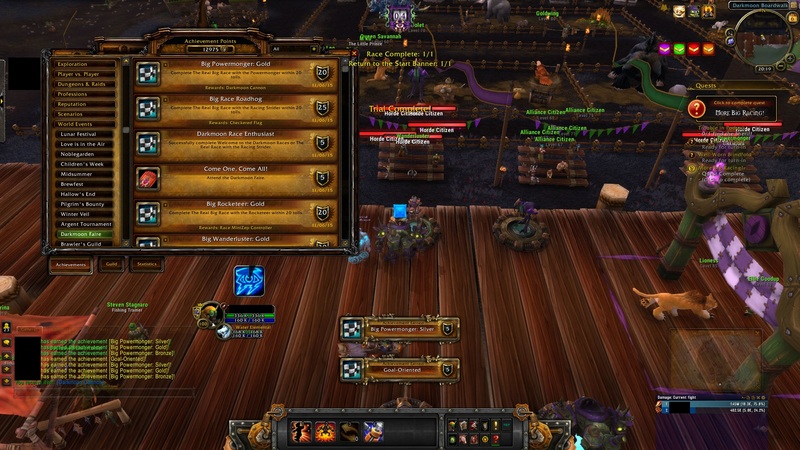 Asmondgold finished in 19 on a live video, I finished ahead of him in real time but at 22/23 Tolls. So I checked all of the videos of these guys doing to course, Yup, they all registered 10 seconds between "Tolls". Well now its 6 seconds!, I timed it. I just about managed it and got my pet using the strategies in the video's, plus I needed to use some extra Rocket Jumps/Boosts and a few new shortcuts, like just after the green post, hitting the rocket icon on the shore and jumping to the upper part of the path, using every blue boost portal and speed portal I could, and I still only just scraped in just before the Toll count hit 21. It took a lot of coins (40 plus) and a lot of trial and error. So if you are feeling like you can't do it even if you follow the vids... that's the reason why. It can be done with the new timer, but it is very very hard. Completa la carrera del siglo con el pollo artificiero en 20 tañidos como máximo.